It would be wise to disregard the advice given from Peter Griffin. Here at Wasatch Health Solutions we see many patients with preventable lower back pain. Whether you’re lifting groceries, boxes, kettle-bells or children it is important to use proper form and efficient bio-mechanics. 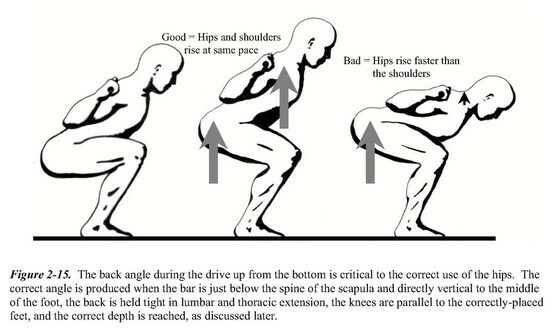 Using the stronger, much larger muscles of your legs including your quadriceps muscle group (ectus femoris, vastus lateralis, vastus intermedius and vastus medialis), glutes (gluteus maximus), hips (adductor magnus), calve muscles (soleus) along with several stabilizing muscles such as the hamstrings makes lifting objects off the ground much easier! The leg muscles enable you to lift objects with ease but more importantly also prevents strain on your lower back and spine. Have we sold you on squatting yet?! Keep in mind large lifts like squats, dead lifts and power cleans require a large muscle recruitment which leads to increased strength, Hgh secretion at night which promotes lean muscle mass and overall well being. Start with practice in everyday activities such as picking up small objects (pens off the floor etc.) with correct form as seen below. 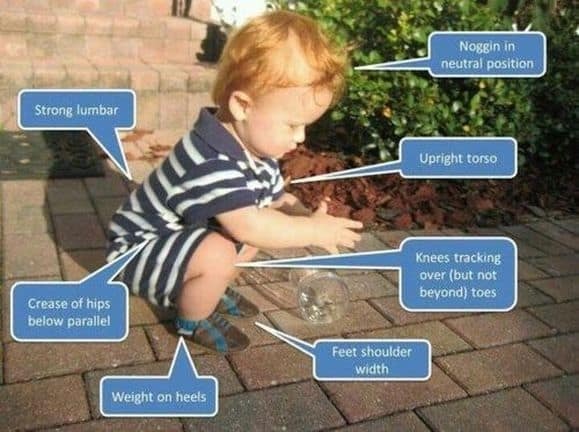 [*Note: the toddler has perfect squat form, we all want to strive to have the form we unlearned from when we were a kid*] Remember practice makes perfect… Or muscle memory.